Savour the heavenly aroma of chestnuts on an open fire- for a traditional Christmas. 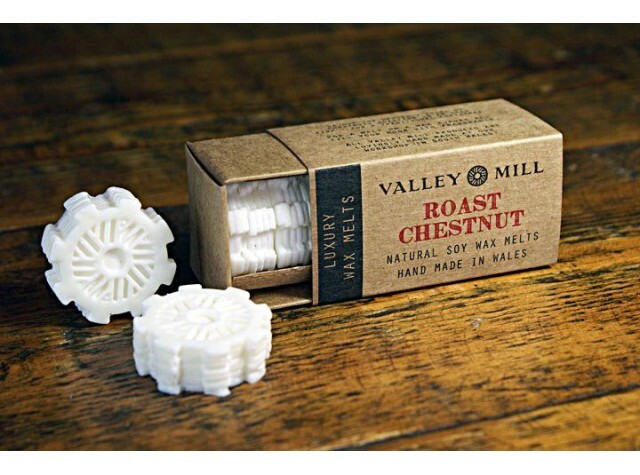 Each wax melt is hand poured to achieve an exquisite cog design which is detailed with the Valley Mill logo and beautifully packaged. To be used with an oil burner. Total burn time per box of melts is 60 hours. Natural Soy Wax with fragrance oils packaged in a recyclable cardboard box. May cause allergic skin reaction. If on skin: Wash with plenty of soap and water. If skin irritation or rash occurs: Seek medical attention. Do not touch or move whilst hot. Do not eat. Keep away from children and pets. Toxic to aquatic life with long-lasting effects.